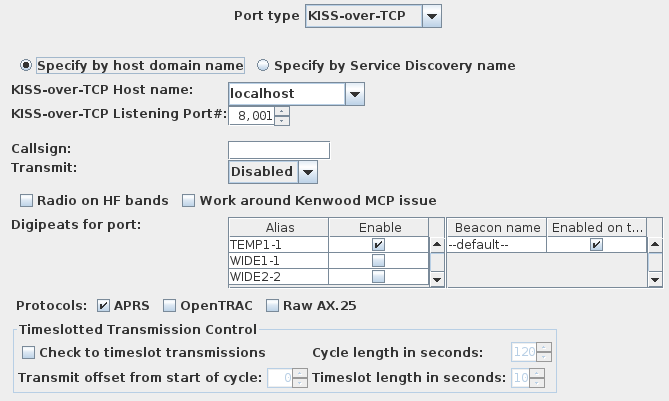 KISS TNCs can be accessed over a TCP/IP connection. This port type supports such connections; however. it assumes that the other software providing the TCP/IP server socket will handle all issues of ensuring the TNC (software or hardware) is in KISS mode over the socket connection. 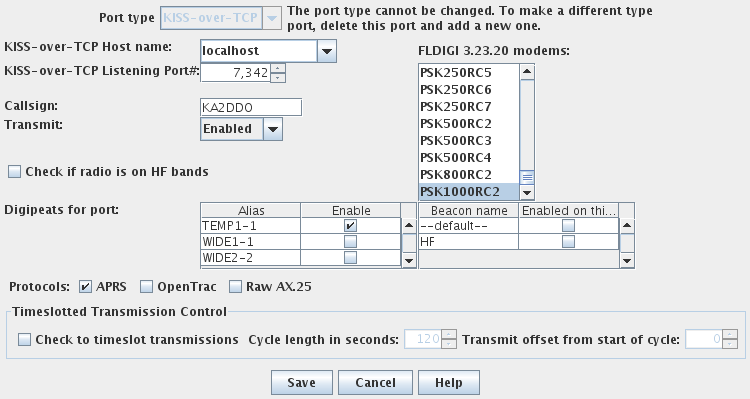 To add a new KISS-over-TCP port, click the Add button on the Configure Ports tab. The port editing dialog will appear. Set the port type to KISS-over-TCP. the IP address of the host providing the KISS-over-TCP service; if left blank, this means the same computer as YAAC is running on. If you are using a reverse-Telnet TCP/IP-to-RS232 adapter to connect to a hardware TNC, use the TCP/IP port number specified in the adapter's documentation for the serial port in use. The callsign you will be using to identify your transmissions over this port. This should be your legal government-assigned callsign with an optional numeric SSID suffix from 1 to 15. Whether or not you want to allow YAAC to make transmissions through the port. If left disabled, you will only be able to monitor APRS traffic through this port. You must specify a callsign to be able to transmit. Whether the radio on this port is tuned to the HF bands. By default, YAAC assumes usage on the VHF and UHF bands where higher bandwidths are permitted. The sub-list of aliases that will be digipeated through this port, based on the total list of known aliases defined in the general configuration. If YAAC receives a message with one of the checked digipeat aliases and this port is enabled for transmission, the message will be re-broadcast through the radio on this port. If no aliases are selected, this port will not digipeat. Multiple aliases can be selected. The aliases must also be enabled for digipeating on the configuration dialog's Digipeat tab. Which of potentially several beacon definitions will be transmitted through this port. If none is checked when the port configuration is saved, the default beacon will be used (and will show up as checked when this configuration panel is next opened). To specify that a beacon should not be sent out this port, a beacon should be selected that is not enabled on the Beacon tab of the expert-mode configuration dialog. The protocols that can be transmitted through this TNC. Generally, only one protocol should be used on a given RF channel to avoid confusion of other stations and wasting of bandwidth. Which supported protocols should be transmitted out a TNC port is specified by checking the corresponding checkboxes. Note that YAAC will support receiving all protocols through one TNC port, recognizing which protocol is in each AX.25 frame by the PID field; this merely restricts which protocols YAAC will send on a port. The "raw AX.25" protocol supports connected-mode packet operation. Whether transmission through this port should be delayed until an assigned timeslot at some offset after the beginning of a repeating interval. Once you have the settings the way you want them, click OK. Ensure that the KISS-over-TCP service providing software is running on the target host before you click OK. At that time, YAAC will begin using the KISS protocol over the TCP/IP socket connection as a communications proxy. To the right will be displayed a list of all the FLDIGI OpModes (or modems) that the attached instance of FLDIGI supports in KISS mode (i.e., capable of sending 8-bit binary data packets) with FLDIGI's currently selected mode also selected on the list. Clicking on an entry in the list will command FLDIGI to switch to that OpMode.